For the whole story of both Mary Jane and Sniffles see Page 10: Mary Jane and Sniffles!. Robert McKimson directed a duo of delightful cartoons featuing the baby elephant, Bobo, who first appeared in 1947's "Hobo Bobo". In this cartoon, Bobo is in India dreaming about going to America to play baseball in the circus, instead of his boring job he has carrying logs. Bobo tries to sneak aboard a ship, but without much success, until he takes the advice of the Mynah Bird (from the Inki cartoons), and paints himself pink because "after all, no one will admit to seeing a pink elephant". He finally makes his way to the big city where a street cleaning truck washes the pink paint off Bobo. He goes to court and the judge sentences him to life in the circus, as part of the elephant baseball team! Unfortunately, he's made bat boy, given the job similar to what he had back in India! Bobo comments: "Bat Boy Shmat Boy! I'm still carrying logs!". Bobo didn't re-appear until 1954's "Gone Batty". This short's story is similar to that of a Friz Freleng's cartoon "Baseball Bugs". In it the Sweetwater Snooks, a baseball team of skinny gentlemen, is losing horribly to the big tough thugs that make up the opposite team: the Greenville Goons. The manager decides to call in Bobo, the team mascot, to play. In the end, the Snooks win, and a reporter exclaims how amazing the baseball playing elephant was, the manager adds "Not only that, but he works for peanuts!". The image of Bobo (above) came from The Non-Stick Looney Page. 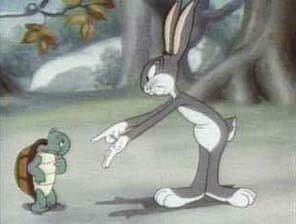 Cecil next appeared in 1943's "Tortoise Wins By a Hare" directed by Bob Clampett. Bugs is at home viewing footage from his previous encounter with the Turtle. He challenges Cecil to another race after discovering out Cecil's secret: "an air-flow chasis"! Bugs creates a turtle-like shell and goes to the race, little does he know that the gambling ring has betted everything that the rabbit is going to win ("In fact, we don't even think the turtle will finish!"). The gangsters mistake Bugs for the Turtle and clobber him. Cecil, dressed as a rabbit, wins the race (Cecil comments "I told you rabbits weren't very bright!"). When Bugs reveals that he really is the rabbit, the gambling ring rabbits say "Now he tells us!" and they shoot themselves in the head! The final showdown between rabbit and turtle occured in 1947's "Rabbit Transit" directed by Friz Freleng. The race takes them cross-country, and Cecil's shell is now jet-propelled. Bugs actually does win this race, but is dragged away by the police after saying that he was "doin' a 100 easy! ", breaking the speed limit. The Wacky Worm, a worm version of Jerry Colonna, appeared in two Friz Freleng cartoons. 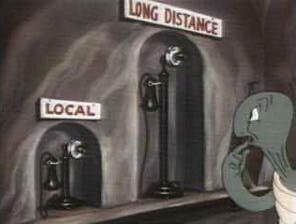 He first appeared in the 1941 cartoon "The Wacky Worm" in which the worm is chased by a hungry crow. His second and last appearance being "Greetings Bait" in 1943, where the Worm is being used as bait by a fisherman. In the end, the Wacky Worm is beat up by an angry crab, to which the fisherman (who turns out to be Jerry Colonna!) comments "Ah yes, embarrassing, isn't it?". "Greetings Bait" was also nominated for an Academy Award for that year. Thanks to James Rice for sending in the above picture! 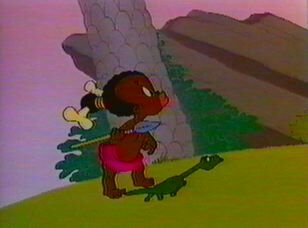 Inki, an African character, appeared in a series of cartoons directed by Chuck Jones. Also, appearing in most of these shorts was a silent, black, Mynah Bird who would hop in tune to the Fingals Cave Overture. All characters and images (c) Warner Bros.